The most commercialized part of the Turks and Caicos, Providenciales remains the islands' tourism heaven, boasting many resorts, hotel chains, and condominiums. On the 12th (Thu), look for gifts at Graceway Gourmet, then play a few rounds at Provo Golf Club, and then kick back and relax at Grace Bay. 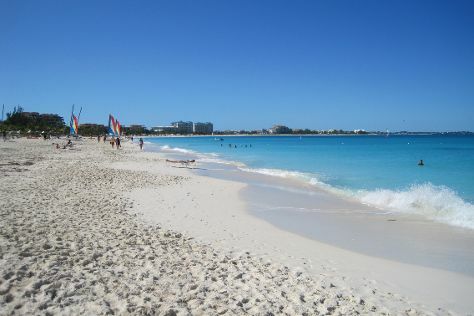 For reviews, where to stay, traveler tips, and other tourist information, read Providenciales travel itinerary creator. New York City, USA to Providenciales is an approximately 24-hour flight. 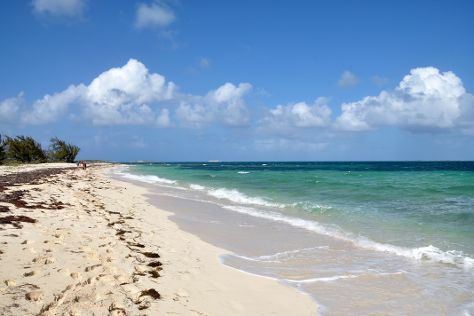 Due to the time zone difference, you'll lose 1 hour traveling from New York City to Providenciales. Expect warmer temperatures when traveling from New York City in April; daily highs in Providenciales reach 84°F and lows reach 76°F. Finish up your sightseeing early on the 13th (Fri) so you can catch the flight to Cockburn Town. Cockburn Town is the capital city of the Turks and Caicos Islands.GeographyCockburn Town is located on the largest island in the Turks Islands archipelago, Grand Turk Island. Kick off your visit on the 13th (Fri): tour the pleasant surroundings at Pillory Beach and then take an in-depth tour of Turks & Caicos National Museum. To see ratings, traveler tips, more things to do, and other tourist information, refer to the Cockburn Town sightseeing planner. Cockburn Town is just a short distance from Providenciales. Finish your sightseeing early on the 14th (Sat) to allow enough time to travel to Cancun. Kick off your visit on the 15th (Sun): look for gifts at Plaza Las Americas, shop like a local with Kukulcan Plaza, then browse the different shops at La Isla Shopping Village, and finally hunt for treasures at Mercado 28. Here are some ideas for day two: stop by Avenida Tulum and then kick back and relax at Playa Delfines. To find more things to do, photos, and tourist information, you can read our Cancun trip builder. The Route module can help you plan travel from Cockburn Town to Cancun. The time zone difference moving from Atlantic Standard Time (AST) to Eastern Standard Time (EST) is minus 1 hour. In April, plan for daily highs up to 85°F, and evening lows to 73°F. Cap off your sightseeing on the 16th (Mon) early enough to travel back home.